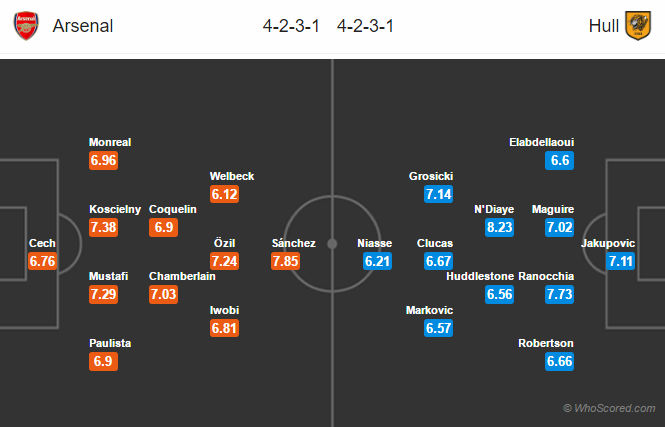 Possible Lineups, Team News, Stats – Premier League match preview Arsenal vs Hull City, gameweek 25. Important things to know. Referee: Mark Clattenburg, Stream Guide: Watch Live. Hector Bellerin is back to training he is expected to start from the bench. Mohamed Elneny is also back from his international duty, he is having a minor calf injury. Midfielder Granit Xhaka is still out with suspension. Danny Welbeck is now fully fit and could get his first start since last May. He has impressed in the recent games. Lazar Markovic who missed the last game against Liverpool is available for selection. Michael Dawon has been ruled out for few weeks with a calf injury. Ahmed Elmohamady is back from Africa Cup of Nations but is likely to be rested. Abel Hernandez remains on the sidelines through a hamstring injury. Arsenal are unbeaten against Hull City in their last six games. Arsenal have lost their last two Premier League games. Hull City have failed to score in 7 of their last 8 away league games. Arsenal have not lost any of their last 13 games against Hull in all campaigns. Arsenal 2 – 2 Hull City, the visitors are in great form, picked up a point against Manchester United and won against Liverpool. They are likely to give a tough time to the North London side.